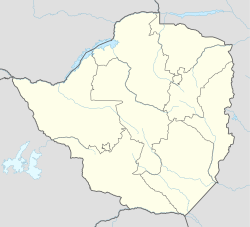 Gweru (named Gwelo until 1982) is a city in central Zimbabwe. Located near the geographical centre of the country, it is the capital of Midlands Province. Originally an area known to the indigenous Ndebele as "The Steep Place" because of the Gweru River's high banks, in 1894 it became the site of a military outpost established by Leander Starr Jameson. In 1914 it attained municipal status, and in 1971 it became a city. The city has a population of 141,862 as of 2013. Gweru is known for vibrant farming activities in beef cattle, crop farming, and commercial gardening of crops for the export market. It is also home to a number of colleges and universities, most prominently Midlands State University and Mkoba Teachers College. The Boggie Clock Tower, located at the intersection of Main Street and Robert Mugabe Way, was built in 1928 in memory of Major William James Boggie. The clock tower is one of the city's most famous landmarks. The Nalatale and Danangombe archaeological sites lie nearby, the former known for its patterned brickwork, the latter for its Portuguese remains. The remains at these sites date back to as early as the Torwa state during the 17th century, the most substantial being a four hundred-year-old stone wall decorated with motifs known to the tradition of stone-building in Zimbabwe. The surrounding area has rich deposits of gold, chrome, iron, asbestos and platinum and supports several mines. The main hotel in the city is the Midlands Hotel, which was opened in 1927 by the Meikles brothers. This hotel was to be demolished but after many protests by the population it was saved. Another important hotel is the Chitukuko (formerly the Hotel Cecil), located in the downtown area of the city. Both hotels were owned by Patrick Kombayi, a former mayor. The Fairmile Motel is just one mile from the city center on the Bulawayo highway . Home to Chapungu Football Club (Waru Waru) an Air force of Zimbabwe football club which plays in the Premier Soccer league of the country. Gweru's local newspaper, The Gweru Times,once ceased publishing in 2015 but now operational. Railways arrived in Gwelo (Gweru) in 1902. National Railways of Zimbabwe have the country's largest marshalling yard, Dabuka, on the south side of Gweru. Dabuka plays a pivotal role in rail movement in the country as it is the central hub of the rail links to Mozambique in the east, South Africa in the south and Botswana and Namibia in the south west, lying on the Bulawayo - Harare Line. As a central city (hub), it has direct links to all the other cities and towns of Zimbabwe. It is 164 km from Bulawayo, 183 km from Masvingo, 471 km from Beitbridge, and 275 km from Harare. Road names used are by destination only, for example the Harare-Gweru Road. There are only mainroads, no highways or freeways. Ezra Tshisa Sibanda, Former radio Broadcaster. ^ a b c "Gweru - The City of Progress". www.mygweru.com. Retrieved 2016-11-14. ^ a b "Gweru | Zimbabwe". Encyclopædia Britannica. Retrieved 2016-11-14. ^ "World Weather Information Service – Gweru". World Meteorological Organization. Retrieved 25 October 2015. ^ "Birmingham Sister City Commission". www.bhamwiki.com. Retrieved 2018-04-25.